Capital and commercial center of Persia; situated about seventy miles south of the Caspian Sea. 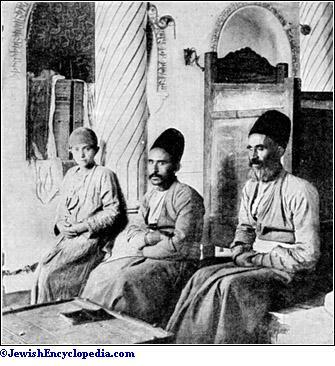 The chief development of the city took place within the last half of the nineteenth century, under Shah Naṣir al-Din, whose court physician, J. E. Polak, was a Jew. The antiquity of Teheran is not great, since its existence can hardly be traced beyond the twelfth century. It appears gradually to have taken the place of the ancient Rai, which sank slowly into oblivion and is now a mass of ruins in the suburbs of Teheran. Rai itself had a long history, being the ancient metropolis of Media mentioned in the Apocrypha as Rages (Tobit i. 14 et seq.) or Ragau (Judith i. 15), in the Avesta and Old Persian inscriptions as Ragha or Raga (Vendidad, i. 15; Yasna, xix. 18; Behistun, ii. 70-74, iii. 1-10), and in the classics as Rhagæ. (Strabo, §§ 1, 3, 19, etc.). It is mentioned as an emporium of Jewish trade by Ibn Khordadhbeh, 817 (see Jew. Encyc. iv. 189, s.v. Commerce). Interior of the Great Synagogue at Teheran. Teheran covers a considerable area, as the wall which surrounds it is eleven miles in circuit and is pierced by twelve gates. The Europeans reside in the northern section of the city, where the foreign legations are located. The Jews live in a quarter of their own. In their daily life they are subject to much the same restrictions and disabilities as the Gabars and the Armenians; and they were formerly liable to acts of persecution which resulted in reducing them to a state of misery, ignorance, and degradation. 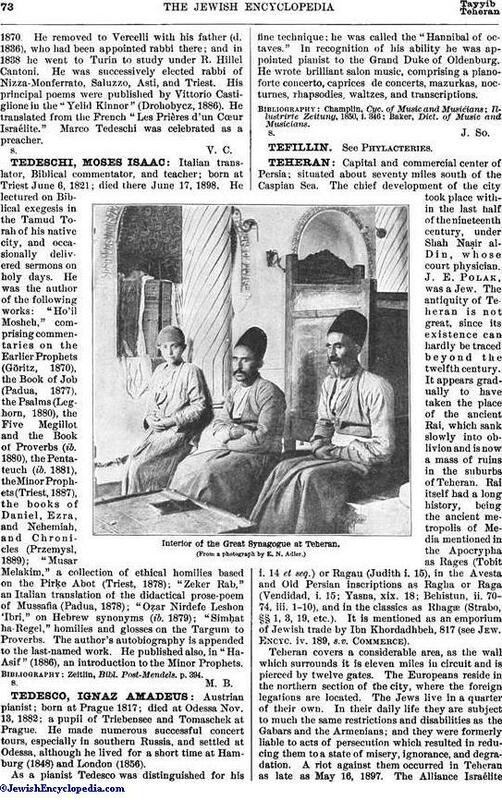 A riot against them occurred in Teheran as late as May 16, 1897.The Alliance IsraéliteUniverselle has accomplished a great deal toward removing this condition of affairs by bettering the position of the Jews in the community and by establishing schools for the education of the children. The Alliance report for 1904 shows a combined at, tendance of nearly 400 pupils at the two schools, established six years previously for boys and for girls. The occupations of the Jews in Teheran, as elsewhere in Persia, are largely those of traders, silversmiths, wine-merchants, and petty dealers. Teheran has a total population of 250,000, including about 5,000 Jews. 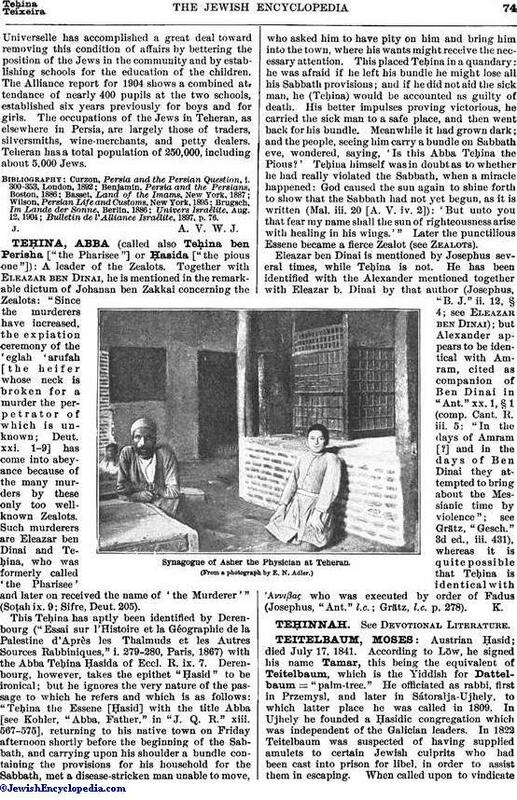 Bulletin de l' Alliance Israélite, 1897, p. 76.